Get out of town with these interesting Helsinki side-trips: Bellevue Beach (in Hanko), Mathildedalin Kylapanimo (in Salo) and Hirsala Golf (in Kirkkonummi). 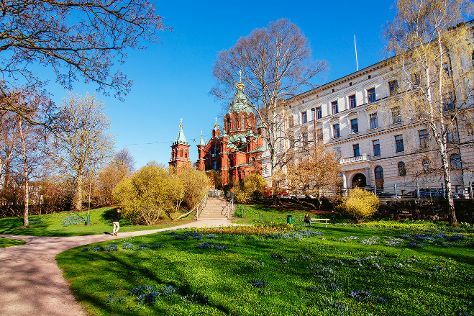 Next up on the itinerary: wander the streets of Katajanokka, make a trip to Senate Square, learn about all things military at Sea Fortress Suomenlinna, and go for a walk through Linden Esplanade. For maps, other places to visit, reviews, and other tourist information, refer to the Helsinki trip itinerary builder site . If you are flying in from Iran, the closest major airport is Helsinki Vantaa Airport. In April, plan for daily highs up to 9°C, and evening lows to 0°C. Finish your sightseeing early on the 18th (Thu) so you can travel back home.